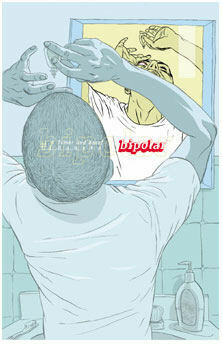 Tomer and Asaf Hanuka are twins. They share a similar genetic structure but were raised in different places. This condition creates a special tension between their stories and styles and is the foundation of Bipolar. Asaf, with writer Etgar Keret is telling the story of Pizzeria Kamikaze about a guy with a broken heart who committed suicide only to find himself at Pizza Kamikaze, a regular day job in a world where everyone died before and now it’s about passing time. Tomer is telling personal stories with a twisted time sense that will put you right now, a year ago, and in the future. The stories featured in this issue: (1) Tomer/ Time strips- this story examines the different identities we wear as our life evolves and the way these identities interact if they were to exist on one time line. (2) Asaf with writer Etgar Keret/ Pizzeria Kamikaze- about a guy with a broken heart who committed suicide only to find himself at Pizza Kamikaze, a regular day job in a world where everyone died before and now it’s about passing time. (3) Tomer/ I Love You- how much of ourselves do we project onto others? By using tow story lines the myth of relationships is explored under highly opposite environments.